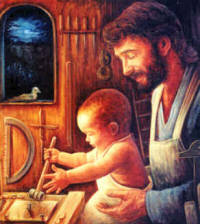 The image we all carry of Joseph is of him standing at a work table hammering on a piece of wood and Jesus, a little boy, standing at his side. Joseph must have been a good man. He lived out a mystery that he could in no way understand, believing on the strength of a dream, something that everyone knows is impossible. Joseph, as foster father of the Lord, gives dignity to work. God used man’s labour to provide food, heat and protection for His Son. God could have brought His Son into the world a full grown man, but instead He chose to let Him be born, raised and taught, by an ordinary human being. This fact gives great dignity to the human person, their work, and to the family: Jesus was not born into a modern, affluent family but into a traditional family. Perhaps our modern lawmakers should think of this when making laws.